One car, two women, miles of open highway. Don't think Thelma and Louise; think Lucy and Ethel. Today is deadline day, so I must be brief. I will do one more trip-related post over the weekend – the statistical rundown. For all those curious about the cost of a trip like this, I’ll present the final accounting report, along with mileage (in Canada, would that kilometrage?) and any other numerical curiosities that arise. After that, I don’t know – what do you think? The trip is over, so the raison d’etre of the blog is gone. The rest of my life really isn’t all that interesting or glamorous. I’ve had fun doing this, even though sometimes I don’t feel like writing – or thinking – at the end of the day, but I don’t think I could maintain the momentum without a focal point like the trip. Are there any topics here that might be food for thought? Or should I just retire to my tent and save my words for print? Whaddaya think? Originally uploaded by Ann Colford. No bugs were killed or injured in the making of this road trip. Stunt doubles accomplished the exciting aeronautics. I’m really glad that my computer keeps track of the date for me because after so long on the road and the confusion of picking up my home routine, I’ve lost complete track of what day it is, never mind the date. Ah, but it is Thursday. This I know because the Weather Channel told me so. For several days now, as I return to my regular schedule, such as it is, I’ve been answering the question, “So, how was the trip?” And I say, “It was great,” or “It was long,” or “Everything went really well, thanks,” or some combination thereof. Each statement is true, and each is a necessary shorthand during the exchange of niceties. After all, it’s not called “small talk” for nothing – according to the social contract, such answers are supposed to be neat little summaries, not dissertations. But if I were to attempt an honest answer to the question, where would I begin? I guess this journal itself is a start; it’s as close to immediate impressions as I could get without carrying a voice recorder around with me everywhere. - Driving through Glacier National Park, climbing the Going-to-the-Sun Road as the clouds rose from the valley floor and crossed the face of the mountains. - Returning to Maine for an all-too-brief visit with Marguerite in Orono and Karen in Portland; checking out the bookstores of Bangor and Belfast, shopping at the Sea Witch in Belfast, falling in love with the Midcoast region all over again, walking the rocky path around Fort Williams at Portland Head Light, then watching the sun go down at Two Lights in Cape Elizabeth; hanging out at the American and New England Studies office at USM, catching up on news of the faculty and other alums with Madeleine and Kent; having lunch with Nancy and Cynthia and meeting 4-year-old Eliza for the first time. - Surprising Father Ignas with an unplanned visit in Putney, Vermont, on the first day of our return trip. - The joy of discovery in the grand Canadian adventure … learning about Tim Horton’s and the plethora of “family restaurants” across Ontario. - The unexpected wild beauty of the northern shore of Lake Superior; fall colors, rocky headlands, the steel-gray waters, the blustery rain; the road signs warning of moose in the roadway – although I wouldn’t want to run into one, I’m kind of disappointed that we didn’t see one. 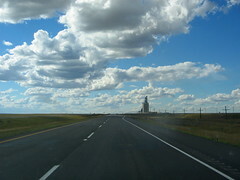 - The wide-open skies of Saskatchewan – not to mention that incredible sandwich and pie at the LC Corral in Broadview. After planning this trip for so long, and then being gone for one day shy of a month, it’s hard to believe that it’s all over and we’re back home again. And yet, life goes on – I’m working on assignments for the Inlander again, I’ve been to meetings already, I’ve got to pay my end-of-month bills this afternoon, and I’ll return to my Thursday night soup group tonight for the first time. Hmm … Well, I can’t say that I maintained my patience with Mom all the time, but I think I did fairly well, considering. The break that I had during my trip to Maine helped. I did gape at my cousins’ children – it just couldn’t be helped. Some of them I haven’t seen for ten years and they’ve gone from elementary school to college in that time. But at least I was able to form a new image of them as they are now, something I can carry with me until the next time. I did renew my ties with the extended family – especially with Bev and Barb, since I stayed in their homes. Now the trick will be to keep those relationships going. I know that’s something we all want to do, and I also know it won’t happen without effort, but I’m going to give it my best shot. I can’t say that I spent a lot of time looking into the eyes of America, although I did give it a few sidelong glances. I found America – and Canada – in the coffee shops and bookstores and gas stations and ice cream stands and even the roadside rest areas. Rural America is still friendly to a stranger; along the turnpikes and in the suburbs of the Northeast, people stay pretty well focused on what they’re doing – they’re generally polite and efficient, although not terribly warm at first. I think it comes from the sheer number of people trying to share the geography. In Canada, ‘most everyone was friendly and happy to see an American taking an interest in their country. I revisited some favorite places – Glacier, the Black Hills, the Berkshires, Portland and Camden in Maine, Plum Island – and I found some new favorites: Belfast, Maine; western Ontario; Yahk and Creston, BC; the Mass MoCA Museum in North Adams, MA; Putney, Vermont. I spent time at the ocean and confirmed my need for frequent visits to the sea. The memories that emerged were good ones. I discovered that there’s nothing like sharing stories with people who know my past – and love me anyway. ☺ And yet, I have many memories here, too. The past did not overwhelm the present on this trip, but simply took its rightful place beside it. I've been getting lots of feline attention since my return home. Here's Henry on Friday evening, trying to make up for his running away from me when I first walked in. My interpretation of “tomorrow” from Friday’s entry expanded across the traditional boundaries of the word to reach now, Monday evening. But since I feel that I am still adjusting to being back home again, the window of opportunity for a thoughtful conclusion to the trip remains open. At least that’s my argument. Our final day of travel on Friday went as smoothly as the rest of the trip, other than waking up way too early. We stopped for a leisurely breakfast – the first restaurant breakfast on the road, no less – at Granny’s Place in Creston before starting the final day of driving. Highway 3 crossed the broad valley of the Kootenai River before climbing up and over the pass between Creston and Salmo. A simple sign at the junction of Highway 6 pointed south to the USA border. After a short wait at the Nelway border crossing, we passed muster and entered both the US and Washington. Within two miles, traffic had stopped for road construction and we had the longest wait at a flagger of the entire trip, about 15 minutes. But the pause gave me time to search the radio dial and I picked up the familiar sounds of KPBX, Spokane Public Radio. Hearing the voices of Steve Jackson and Verne Windham seemed both extraordinary and commonplace at the same time. The towns of Metaline Falls, Metaline, and Ione seemed smaller than I expected somehow, although Metaline Falls has a great little Main Street just off the highway where I was able to get coffee for the road. The highway followed the Pend Oreille River through Box Canyon and its trees and hills Before long, we crossed the county line into Spokane County near Deer Park; a few minutes later we entered the city itself amid the traffic at the North Division Y.
I’ve been incredibly tired for the last couple of days, something that’s perhaps not surprising but it is somewhat annoying. As I type this, it’s not even 10 p.m. and yet I can't keep my eyes open. Looks like the final review will have to wait yet another day. It’s Thursday night and I’ve made it to within three hours of Spokane. The pull toward home is great, but I opted for one more night in a motel rather than getting home in the dark. We are in scenic Creston, British Columbia, north of Bonners Ferry and Sandpoint, Idaho, staying in a cabin unit at the Valley View Motel. This is a sweet little family-owned place with only 15 units, all in separate one- or two-unit cabins done up in a vaguely Bavarian theme. We have a fridge, a TV, a coffee maker and even an electric kettle – but no Internet access. Alas, my string has ended. Oh, I could probably work out something with dial-up, but I figure, what the hell, I’ll be home tomorrow – I can upload then. Today’s route carried us from the prairies to the mountains and into the pine-covered slopes of our own backyard. Along the way we saw plenty of autumn color – just in time for the equinox – and some spectacular alpine views. Although I didn’t drive nearly as far today as yesterday, I feel just as weary. Mountain driving is more tiring, I find, and when the scenery is as grand as we saw today, I spend much of my time admiring the views – or looking for places to pull over so I can do so safely. The pleasant surprise of the day came late this afternoon, just a few miles up the road from Creston in the tiny hamlet of Yahk, BC, where we stumbled upon Two Scoop Steve’s Ice Cream and the Goat Mountain Soap Company. Nestled in the trees along the banks of the Moyie River, these businesses are run by the same family. We pulled in as the owner happened to be outside talking to visitors, so she invited us in even though they’re in the midst of closing down the ice cream shop for the season. She still had about 8 or 10 flavors available; the blueberry was a knockout. As we ate, we walked along a trail through the woods a short distance to the river then wandered back to visit the goats and the soap shop. The goats – Minnie, Martha, Annabelle, Antonio and Penelope (hope I’m not forgetting anyone) – scrambled up a gangplank to the roof of the porch to greet us. They all seemed curious, but Minnie was the most vocal. Tomorrow I plan to drive just a bit further west to the border crossing at Nelway and aim straight south for Spokane via Metaline Falls. We should be home by early afternoon. So this is the last evening that I’ll sit in a motel room (or a relative’s house) and try to recall the experiences of the day – at least for this trip. Seems like I should have some profound thoughts tonight summing up the trip, but I’m too focused on getting back across the border and safely home to think of much else. From the vantage point of my office at home, I’ll go back over the goals I set at the outset and see if the reality of the trip in any way reflected what I thought might unfold. As I drove today, I found myself thinking about my life at home and what I might like to change about that life – now that I’ve been away from it for almost a month. Mostly, it’s little stuff, things that need nothing more than either self-discipline or giving myself permission. Now that I’ve reconnected with so many of my east coast relatives, I want to maintain those relationships – and I know it will require effort, as all relationships do. And yet I recognize a need for more quiet time, too, more down time – something that is the first to go when my time gets crunched. It’s the dance of balance faced by so many women I know: meeting the needs of others, like the demands of job, home, and family, while taking care of oneself. In a way, I’m relieved to not have Internet access tonight. I’ll write my entry here and download the photos of the day, but then I can just crawl into bed and read. There’s no radio to distract me and we turned off the TV after dinner, so there’s nothing else to do. To put it another way, I have no choice but to give myself permission to relax. It’s a good way to spend the final evening of this grand adventure. The Rockies rise out of the prairie near Pincher Creek, Alberta ... with Mom's favorite road sign in the foreground. After a long day of travel, we’ve made it to the province of Alberta. I can tell that we’re getting closer to home because the cable TV system here carries the stations from Spokane. The prairies unfurled beneath our wheels today, from the wheat fields near Brandon, Manitoba, across the breadth of Saskatchewan, to the rolling rangeland of eastern Alberta. Hay bales that look like rolls of shredded wheat dominated the eastern landscapes today; later, grain elevators took over the horizon. By evening, I’d spotted sagebrush amid the roadside vegetation. After leaving the lakes and forests of western Ontario yesterday afternoon, we’ve somehow shifted from the east to the west. The landscape tells me, but so does the quality of the air: drier, crisper, tinged with a hint of sage. Prairie driving is easy for me, with wide-open roadways and minimal traffic. The sky is what holds my attention here, the changing colors and clouds and shadows. Everything else seems small under the immense spacious heavens. And yet odd details grab my eye: a duck in that teardrop of a pond, diving as we pass; the rich copper of the swaying grasses; a lone hawk perched high atop the tree at the edge of the windbreak. Early autumn has settled gently on the Canadian prairies, although the calendar marks today as the last full day of summer. The grasses and trees glow with the tawny shades of the season to come. Combines gather the last of the wheat harvest and long trains of grain cars haul the bounty to distant markets. We hit another fun little lunch place today: The LC Corral in Broadview, Saskatchewan. I had missed the turn to a restaurant in the previous town – and I really hate to turn around when I’ve got momentum going. Broadview is not much more than a wide spot in the road, and the place didn’t look like much from the outside, but the parking lot was full – always a good sign. Everything was delicious, down to the homemade pumpkin pie for dessert, and it was a bargain besides. The God of Hungry Travelers smiled on me. Before stumbling upon the LC, I was pondering what it means to be open to the experience of the road. In order to have the joy of discovering a place like the LC, or like Lorraine’s the other day, I have to remain open to the possibility of a mediocre or even bad experience. There are times when a standard product – like you’d find at a chain restaurant – is comforting, but the most memorable meals are found elsewhere. Buying a standard brand means we never have to have a bad experience, but is that what we really want? By eliminating the risk of the truly bad, aren’t we also eliminating the possibility of true joy? Of course, there are times when I’ll choose the comfort of the familiar over the risk of the unknown; I’ve had several meals from Subway on this trip, not to mention my newfound fondness for Tim Horton’s coffee. But I hope I choose places like the LC and Lorraine’s more often than not, because I don’t want them to go away. They don’t just feed our bodies; they feed our souls. The vicarious travelers all wanted to stay in Canada, so here we are. Actually, I checked on cat-care coverage and then heeded the advice of friends who said, basically, don’t rush through the end of a trip like this one. I knew that – really, I did – but I sometimes have a hard time paying attention to my instincts. So tonight we’ve landed in Portage la Prairie, Manitoba. I picked it because of the name, but I haven’t asked anyone the correct pronunciation. En Francais, c’est “por-TAHZHE lah prah-REE”; in English, “POR-tej lah PRAY-ree.” Do the locals prefer one of these options or perhaps a strange hybrid? We are definitely on the prairie now, but we spent most of the day in the forest-and-lake country of western Ontario. Let me tell you – Ontario is huge. Those of you from Montana or Texas may suffer the delusion that your state is big. Try driving across Ontario and you’ll come away humbled. I entered Ontario early Saturday afternoon and finally crossed the Manitoba border about 3 p.m. today, Tuesday. That’s big. Coming into Thunder Bay last night, we saw a huge rainbow stretching from one side of the city to the other, and it brought back memories of the rainbows we saw on the very first day of the trip, near Flathead Lake. This morning, after deciding to stay in Canada for the duration, we left the city under a blanket of fog. As the sun burned through the haze, diffuse rainbow colors shimmered in the rising mist. I took that as a sign that I had made the right decision. After three days of driving, I’m still in Ontario and still in the Eastern Time zone. Canada is amazing, eh? Yes, I’m still in Canada. No, I’m not sure yet which route to take tomorrow. I’d love to stick with the northern route, but that would mean I wouldn’t have a prayer of getting home on Thursday as planned. If I drop down into Minnesota tomorrow, I can pick up I-94 and zip across North Dakota and Montana with relative ease. I’d have to push to get home by Thursday night, but it could be done. If I stay in Canada, then I’m sure I wouldn’t make it back to Spokane until sometime Friday. We traced the northern shore of Lake Superior today from Sault Ste. Marie to Thunder Bay. Clouds and drizzle rolled in over the steel-gray lake, but that just made the scenery more moody and dramatic. The fall foliage was in full force (ooh, alliteration!) 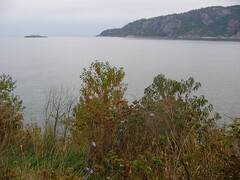 between the Soo and Wawa (yes, that’s really a town), complemented by the reddish tinge in the great rock outcroppings along the highway and the shore. Curiously, everything was mostly still green further north. I thought a lot about the joy of discovery today. As the landscape revealed itself, I thrilled to each new turn in the road, each vista and tiny town. Clearly, I am neither discoverer nor explorer, in any grand sense of either word, but within my own world, I am finding new places and experiences. On this leg of the journey, I have let go of the familiar and I am recovering a sense of adventure, a way of traveling that leaves some things to chance. It’s not a huge adventure, mind you – a great risk-taker I am not – but it’s a step toward greater spontaneity. And thus another evening closes without a decision. I’ll sleep on it. This photo tells the story of today's travel ... low clouds and drizzle and the dramatic scenery of the northern Superior shore. Somebody got married last night in Pembroke. Several dozen of their closest friends came to the reception at the Pembroke Inn. I had a bad feeling when many of the revelers mingled in the hallway outside our room in the early evening and looked annoyed as I tried to squeeze by while laden with all our baggage. My sense of impending conflict was heightened when two adorable little girls in party dresses raced up and down the hallway while screaming at the top of their lungs, egged on by a man who was probably an uncle. And my premonitions came to full reality when I was awakened at 1:30 a.m. by the sounds of a major party taking place on the other side of the wall from my bed. I ignored the raucous laughter for a time, but it was the singing that got to me. I’m not sure what they were trying to sing, but it wasn’t pretty. That’s when I got up and called the front desk. After that, the noise intensified. I swore they were jumping around and tossing the furniture about – the floor and walls of our room shook. The revelry continued and I lost track of time, finally dropping into a tired stupor sometime well after 3 a.m. I woke up at 7:30, as usual, although I moved more slowly than normal and we didn’t hit the road until nearly 10. So that was the nightmare portion of the day. Fortunately, things improved from there. Thanks to the sympathetic and kindly front desk clerk, I learned about Canada’s answer to Starbucks: Tim Horton’s. 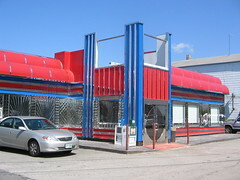 Actually, it’s kind of a cross between Starbucks and Dunkin Donuts: good solid basic coffee, with only a few frou-frou specialty drinks; lots of doughnuts and other baked goods; and an incredibly busy drive-thru window. Nearly every town of 2,000 or more has one, so it’s a great place to stop along the road. 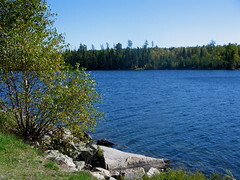 The route of choice, Highway 17, rolls through the Ottawa River Valley and then across the Nickel Range – the old mining areas around Sudbury. (Quick research tells me that the Sudbury region produces 30 percent of the world’s nickel. Pretty impressive.) It’s a two-lane highway most of the way. 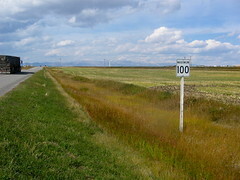 The highway bypasses the largest towns (like Sudbury and Sault Ste. Marie) but catches the small and medium-sized towns. This is a different style of travel than an American interstate, especially in the eastern US. While there’s some standardization – like Tim Horton’s, occasional fast-food outlets, and chain motels in the larger towns – this mode of travel offers far more chance for serendipity. A case in point is Lorraine’s Restaurant in the town of Sturgeon Falls, a few kilometers west of North Bay. I wouldn’t have found it if I hadn’t seen the sign from the parking lot next door. It’s tucked around the back of a non-descript strip mall building, behind Jean-Marc’s Boulangerie and next to the indoor flea market. The Sunday brunch crowd was out in full force; homemade pies, cakes and squares are the specialties. Everything was delicious and the prices were right. So now I’m torn. I’m enjoying the low-key nature of Canadian road travel, although I feel as though I’m flying blind – I have no AAA (or CAA) tour books to help me locate lodging. I’ve been lucky so far (the wedding party notwithstanding), but I don’t know what the prairie provinces will hold. On the other hand, I’m getting anxious to get back home and the speed of US interstate highways holds some allure in that regard. Plus, it’s familiar. Still, when will I have another opportunity to see so much of Canada? Here's Mom between Fr. 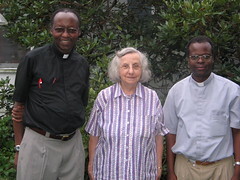 Ignas (on the right) and his colleague from Tanzania, Fr. Remi (on the left). From now till next May, Ignas will be assisting the parish priest who serves 3 parishes in and around Putney, VT. Fr. Ignas spent two years in Spokane studying at Gonzaga University. 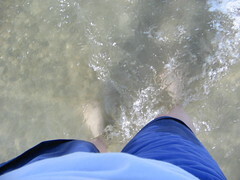 Yes, those are my feet standing in the Atlantic Ocean at Plum Island in Massachusetts on Wednesday. My feet and the rest of me had a great good time at the beach. Sorry for the long delay between posts, gang. The last few days have been a whirlwind of last-minute visits, along with preparation for the return trip – and a little bit of work, too. (Watch for an article in the 9/22 issue of The Inlander.) And now we’ve been back on the road for a couple of days with several hundred miles already logged on the westward journey. Quick impressions: Visiting Maine was wonderful and leaving Maine was hard; Mom stayed with her sister Joan for the last few days, giving them lots of time to visit; I finally got my trip to the beach on Wednesday – went to Plum Island near Newburyport, Massachusetts, with Dawn and Mom; the humidity seeped back in on Wednesday ahead of tropical storm Ophelia; the rain began on Thursday and we’ve been in rain ever since – although the sun finally broke through late this afternoon here in Pembroke, Ontario. Yep, I decided to return via Canada – for at least part of the route. I figure that’s one sure way to avoid Chicago. So … we left yesterday (Friday) around noon after our third meeting with The Breakfast Club at Mary Ann’s Diner in Derry. Drove across southern New Hampshire in low clouds and fog and occasional drizzle. Crossed into Vermont near Brattleboro and made a quick diversion to the small village of Putney. Folks from St. Ann’s, listen up – I visited with Fr. Ignas at his new home here and met his colleague from Tanzania, Fr. Remi. He has a lovely room at the Society of St. Edmund in Putney and will be traveling to three parishes in the area, helping the parish priest, Fr. Fred. Everyone there welcomed us with open arms and we had a lively visit over coffee and snacks. Despite the continued low clouds and fog, Vermont was lovely. The rain saturated the hills in shades of green with occasional hints of the fall colors to come. We crossed into New York west of Rutland and spent the night in Ticonderoga, site of the historic fort from Revolutionary War days. Still cloudy with drizzle today. We aimed north then west across the Adirondacks and crossed the international border into Cornwall, Ontario. I had my passport and Mom’s ID at the ready, but we didn’t need it – the Canadians are far more welcoming. I broke into a verse of “O, Canada!” while driving over the St. Lawrence Seaway and stopped at the first bank I saw to get some of that pretty Canadian currency. Then it was on to Ottawa and westward to the town of Pembroke, in the valley of the Ottawa River – and the Pembroke Inn, with wi-fi access in the room. The only adventure today – other than crossing the border – was getting lost in Plattsburgh, NY. Let me say here, as a veteran of many miles and many cities, that the directional signage in Plattsburgh is woefully inadequate. And where there are signs, they are misleading, incomplete, or just plain wrong. I managed to negotiate my way out of town and onto the correct westbound highway by instinct, and I metaphorically shook the dust from my shoes as I watched Plattsburgh recede in my rear view mirror. Civic officials of Plattsburgh, ya got some work to do. 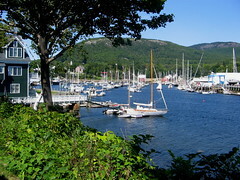 Camden gets lots of visitors, making it hard to find a place to park, but it wins my vote as the most scenic harbor town on the coast. ... actually, I'd use the word austere. 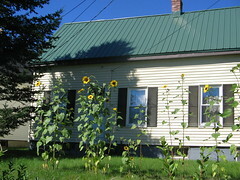 The sunflowers add a nice touch. Seems like old times – I’m hanging out at a café on Exchange Street in Portland’s Old Port. For a minimal purchase, I get 30 minutes of wireless Internet connectivity, so I can finally upload photos and update the blog. I left Orono early yesterday morning and took the coastal route back to Portland. The drive took nearly all day, but it was great fun to revisit a favorite coastal town – Camden – and discover a new favorite – Belfast. On Marguerite’s recommendation, I stopped at the Belfast Co-op (Spokanites, think Huckleberry’s with a somewhat more crunchy granola feel) and had coffee and a low-sugar, low-fat muffin (which was really pretty good). The Belfast waterfront is mostly devoted to pleasure craft now, it seems, but evidence of a blue-collar past remains. Many of the red brick storefronts lining Main Street now cater to the tourist trade, but the place hasn’t gone totally upscale – at least not yet. At the Fertile Mind Bookshop, three friendly folks gathered for coffee by the light-filled front window and invited me to join them. 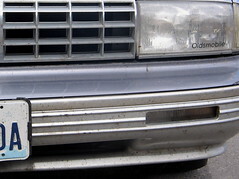 Sadly, I knew I had many miles still to drive, so I declined. Camden was its usual scenic self, and it wasn’t even overrun by tourists, although most businesses buzzed with activity. I found a parking space not far from downtown and had a grand time wandering around. By late afternoon, I arrived at Karen’s apartment in Portland’s West End. It’s in a great old Victorian with wood floors and an updated kitchen and has much more space than her previous place. We then drove out to Portland Head Light at Fort Williams in Cape Elizabeth and walked the oceanfront path above the rocks. The sky was so clear, we could see all the way to the Seguin lighthouse near Popham. (Karen asserts that one can see Seguin from any point along the Maine coast; today, at least, she proved her point.) Later, we cruised further down the road for dinner at the Lobster Shack at Two Lights. (Fresh haddock – yum.) The breeze had picked up, so we stayed inside to eat, but then we walked out on the rocks as the setting sun painted the sky all around us. Today, I’ll visit friends and old haunts here in Portland, then it’s back to New Hampshire. Tomorrow I need to begin planning my return route because we will be leaving again on Friday. Time has flown. Today is one of those incredibly beautiful days in New England, the kind of day that makes you believe that nothing bad could possibly be happening in the world. (Of course, we know differently, but it’s a pleasing delusion.) Skies are a deep, rich blue, dotted with cotton ball clouds, and the air holds a taste of fall’s crispness. A steady breeze rustles the still-green leaves and temperatures hover near 70. 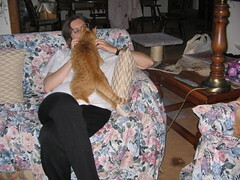 At Marguerite’s funky house in Orono, I’m getting my fix of feline attention – and some canine attention, too. She now has four cats (V.I., Henrietta, Seamus and Ivan) and a sweet but neurotic pooch named Jenny. Henrietta slept on the bed with me, and Ivan, who’s only five months old, came up in the morning to give me kisses and curl up under the covers. Even V.I., the resident curmudgeon, deigned to let me pet her. Orono is a pretty typical New England university town, a few miles north of Bangor and home to the University of Maine. This morning, we walked uptown to attend a little street festival being held right in the center of town. Several community organizations had booths there, and some local musicians entertained from the stage. 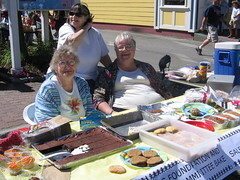 The ladies of the local housing foundation staffed a bake sale booth with all manner of sweet goodies and Pat’s Pizza sold pizza by the slice. We hit a decent yard sale on the way there, too. It’s six a.m., I’ve been awake for an hour, I’m sleep-deprived – it’s a perfect time to update the blog, I think. This morning, I awoke in the Star Wars-themed bedroom of my cousin Barb’s five-year-old, Justin. The night sounds of crickets and tree frogs slip in on the damp morning air. The birds are finally waking up – I just heard the first blue jay. Fortunately, the animated Darth Vader action figure on the bureau has remained quiet. Although it’s early, there’s been activity in the house for nearly two hours. Barb’s husband, Sam, has to get up at 4:30 a.m. each day to make the commute to his job in Lexington, Mass., a drive that takes an hour in traffic. Barb is up now getting ready for work and her two older sons will be up soon to prepare for school. Just so no one feels guilty, let me assure you that none of this activity woke me up this morning. I woke up on my own at five a.m. and couldn’t get back to sleep, despite being tired. You’ll have that sometimes. 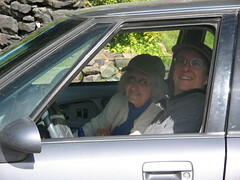 Today, I’ll be driving up to Orono, Maine, to visit my friend Marguerite. We met while we were both in school at the University of Southern Maine in Portland, about eight or nine years ago; now she works at the University of Maine in Orono. I’ll be stopping briefly in Portland to see my friend Karen on the way through, and then I’ll return to Portland on Sunday for an overnight visit. Mom is staying here with Barb, so this weekend is my little getaway. I’m looking forward to seeing Maine again, to catching up with friends, and to being off-duty, even if just for a few days. (Shhh, don’t tell Mom. She doesn’t think I have any need to be ON duty.) I harbor dreams of dividing my time between Spokane and Maine at some unknown point in the future. In Spokane, I have a community of friends that feeds my soul; in Maine, I have a handful of close friends and geography that feeds my soul, plus it’s closer to the family and friends in the rest of New England. Although I didn’t grow up in Maine – and in Maine-speak, I will always be “from away” – the place feels like my native soil. At least it did six years ago; I’m curious to see if that’s still true. Now I think I’ll ease downstairs and have my morning cup of tea before it’s time to get Mom up. Ya gotta love the Globe sports section ... it actually takes time to read the whole thing. One of the great joys of being in the Boston area in September is that I can watch all of the Red Sox games. Ted has a high definition TV in the living room, so we gather there to cheer on the hometown team. I find that early innings and early-in-the-season games don’t interest me much, but come September, I can’t get enough. Tonight, Big Papi (that’s David Ortiz, for the uninitiated) hit a homer in the bottom of the ninth to break a tie and give the Sox yet another dramatic victory. The Yankees lost (another cause for celebration) so the Sox now lead their division by four games, I think. 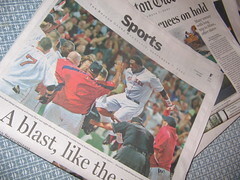 Not only can I watch the games; I can read the Boston Globe sports section in the morning and relive the joy. Go Sox! The theme today is houses of my past. Mom and I are doing the grand tour of Reading (our hometown). Many things have changed, but many have not and that’s where the memories come out. I visited the neighborhood where I grew up; no one was home at our old house, but I stopped to talk to a guy mowing the lawn across the street. Turns out he’s the grandson of the people who owned the house when I was growing up. Sounds like the folks who bought our house from my parents still live there, so I may try to check back sometime when they might be home. Next, we drove past the high school (currently under renovation) and the house my dad grew up in, and we stopped in to see my uncle and aunt at their house. We went past the site of Mom’s childhood home (her house was razed in the 60s, sadly) and now we’re sitting in the Reading Public Library, happily tapping into their WiFi network. The library took over one of the old elementary school buildings several years ago, and it’s the school Mom attended in fifth and sixth grades. Earlier today I met my friend Diane for coffee at one of two Starbucks shops now located in Reading. (Reading never used to be a coffee shop kind of town, so we both found it rather odd – especially since the shop is located at the site of the former town dump. That’s one of those things that’s changed.) Diane and I have known each other since we were ten, and we’re always able to reconnect no matter how different our lives have grown. Fortunately, we have no big meetings or visits on tap for the rest of today, so maybe I might finally get that nap I’ve been wanting since last week. Gotta make more phone calls to coordinate visits later in the week – like tomorrow. Maybe one more good night’s sleep will help. One can hope. Okay, school’s out here now and the crowds are rolling in. Time to go. Here's the happy couple, Joan and Bill Post, dancing the last dance of their 50th anniversary party, surrounded by family and friends. Tonight feels like fall. The air dried out and temperatures dropped. The crickets chirp and other night sounds drift in with the chilly air. Today was a picture-perfect day, sunny and in the 70s. The past few days have been a whirlwind of visits and a swirl of memories. I’m ready for some downtime but we have many people still to see and others who we need to see again. I feel like time is a precious commodity, even more so than usual. We had a grand time at the party on Saturday night – it was a family reunion. I saw cousins I haven’t seen for years, and we talked and visited all night long. 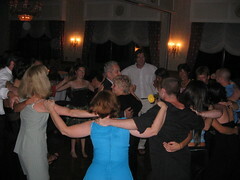 Except for when we danced – in keeping with family tradition, the cousins all danced up a storm. And now the next generation is coming along and following in the same tradition. Today we had a barbeque (or, in New England parlance, a cookout) at Mary and Ted’s house in Wakefield, and we got to catch up with more family and friends; yesterday, we did the same at Chris and Dawn’s house, after having brunch with Barb and Bev and their families. 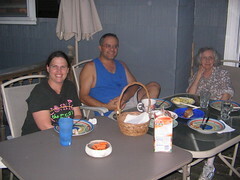 The first dinner with family, Wednesday, August 31, as the clouds from Katrina raced overhead. (The rain came a few hours later.) L-R: Dawn and Chris Colford, and Mom. Colin and Jesse were having a swordfight in the backyard while we visited. Later, we went inside and watched the Red Sox game. Sorry for the long gap between postings … I was writing at night but didn’t have any Internet connections in the last two motels. And I was doing my best to travel faster than the Storm Formerly Known As Katrina, so I didn’t take the time to search for a wireless hot spot. The news of the day is – we’re here! Arrived in the Boston area about 4:30 p.m., after spending the day being tourists again in the Berkshires. Stopped in North Andover to greet cousin Chris and Dawn Colford (and Colin and Jesse, who are far bigger than when I saw them last) and had dinner out on their deck as the wind tossed leaves around and the clouds zipped by overhead. Then drove another 20 minutes or so up to Derry, New Hampshire, where we settled in with cousin Bev and Barry (and Ryan and Alicia, who are also much bigger than I remember). Auntie Joanie and Uncle Bill came to see us, even though it was already 10 p.m., and we all sat around the kitchen table and had tea – reviving a time-honored Bennett family tradition. The heavy rain finally hit here about 11 p.m., but we were all safely inside (except for Alicia). Then Bev and I stayed up and yakked till 2 a.m., so I think there’s a nap in my future. We had a great time visiting favorite old haunts in the Berkshires: Main Street in Stockbridge (where we had breakfast at the Main Street Café and wandered through the lobby of the venerable Red Lion Inn); the Norman Rockwell Museum in Stockbridge, now in expanded digs; the back roads between Stockbridge and Lenox; Williamstown; and a new favorite, Mass MoCA, a great new museum of contemporary art set in a sprawling old mill complex in the former textile town of North Adams. The cavernous old industrial spaces make an incredible setting for huge art installations, things that couldn’t possibly fit in an average-sized gallery. And the exhibitions are curious enough and eye-popping enough to even keep kids interested (at least for a while). Our short visit didn’t do justice to the place, but I highly recommend it for anyone even close to the area. Now I think I’ll go take a walk, something I haven’t done for a few days. Then I’m aiming for that nap. 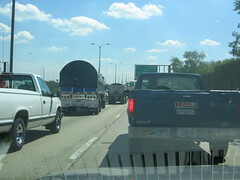 My only other goal for today – besides catching up on my blog – is to NOT drive. Oh, and the final mileage count to date is: 3,166 miles. Now that we’re reasonably settled here, I may not post every day, but I’ll update whenever there’s news of a visit or event to report. Oh, and there are more photos on Flickr … just click on the photos here to open a larger version in Flickr and you’ll see the link to my photostream. And thanks for all the comments – I’m glad people are riding along vicariously! 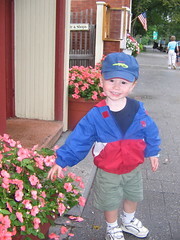 This is my little friend Keenan who was walking up and down Main Street in Stockbridge with his mom. I first saw them while we were eating breakfast, and he was still there when I went out to take pictures of the impatiens lining the sidewalk. He had to show me the flowers and even handed me a petal. 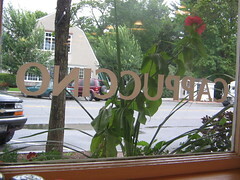 Yes, I found breakfast in Stockbridge, sitting at this great window overlooking Main Street -- great people-watching! 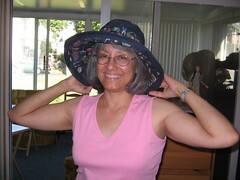 Ann is a writer for the Inlander.